That is the first principle of precision cleaning. Starting with the evaluation of contaminants on the parts to be cleaned using the correct chemistry and process can never be over emphasized. Using the right chemistry, process, fluid purity, appropriate raw materials for construction, and agitations including spray and ultrasonic are key to removal of organic, inorganic and particulate contaminants. JY offers both hydrocarbon solvent with recovery and aqueous cleaning systems using robotic and conveyor transporters for the electronic, metal working and hard disk drive industry. 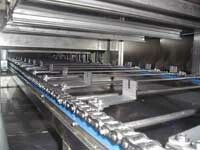 The conveyor cleaning system delivers high throughput at economical costs and is the system of choice for hard disk drive base and tray components manufacturers. We can offer a turnkey package including cleaning system, chemicals, ultra-pure water, preventive maintenance for easier operation. Cleaning baskets have been transferred into machine by conveyor, and moved to ultrasonic tank, washing tank, rinsing tank and dry tank (tank can be increased by requirements) by batten type. These products can be electronic audio parts, precision accessories, PCB board, semi-conducting and optical instruments. 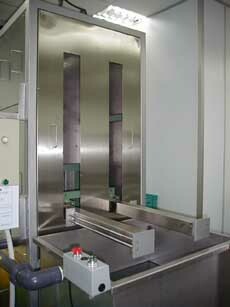 For a special purpose of cleaning the operation instruments in the hospital. This machine will disinfect and wash the operation instruments by using ultrasonic high-frequency oscillation, and washing and rinsing by co-operating with detergent (fixed amount to be added). ※Ultrasonic is the pathway of surface cleaning for increasing high quality, producing efficiency and decreasing costs. Ultrasonic washing can be used very generally, such as electric equipments, electronics, vehicles and industrial instruments, the degreasing of optical lens, taking off adhesive goods from surface and washing goods. The excellent ultrasonic washing machine has been used to co-operate with washing works in the manufacturing, also improve the efficiency of manufacturing, quality of washing and working environment by using single tank, multi tanks and automation. The ultrasonic washing is formed by generator and transducer to co-operate with washing tanks. 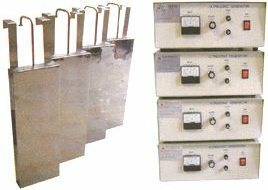 The ultrasonic high efficiency vibration employs the transmission of changer in the liquid of washing tank, and the goods will be cleaned by the irradiation of ultrasonic waves.